Home Inspiration What is a portion of fruit? 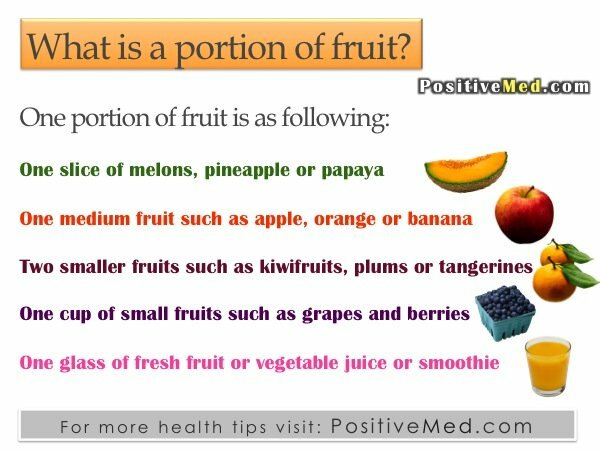 What is a portion of fruit? 2 or more small-sized fruit:such as 2 plums, 2 satsumas, 2 or 3 apricots, 2 kiwifruits. Large fruits: half a grapefruit, 1 slice of papaya, 1 slice of melon (2-inch slice), 1 large slice of pineapple, 2 slices of mango (2-inch slices). Here is a note about juices: A 150 ml glass of fresh juice (fruit or vegetable juice or smoothie) counts as 1 portion, but you can only count juice as 1 portion per day, however much you drink. This is mainly because it contains very little fibre.